Been quite a few weeks for our friends the 4 Boys. First Caleb Graduates (actually, that was his second commencement we attended, the first one was here - holy smokes, I'm old! ), and now Brady is having his Bar Mitzvah! Back to back simchas, what more can one ask for? 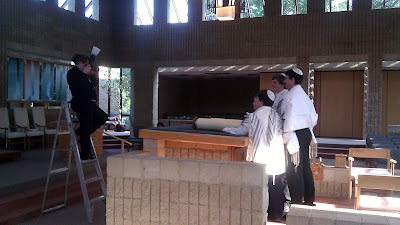 Today, I stopped by the shul to catch the boys doing their rehearsal and to watch our friend Erin shoot the photos (yeah, that friend Erin). It was all so official, and brought back vague memories of my own Bar Mitzvah. My parents always had this philosophy about the photos of events like this. Once they're captured, the event is effectively over. Sure, the Bar Mitzvah actually has to happen, but years from now, it'll be the photos you refer to, and that will shape how you saw the event. So, once the photos are done, you can take a deep breath, the hard part is done. It's a philosophy I've tried to embrace. Even though I had every intention of staying out of the way, I couldn't resist at least snapping a few photos of Erin at work. 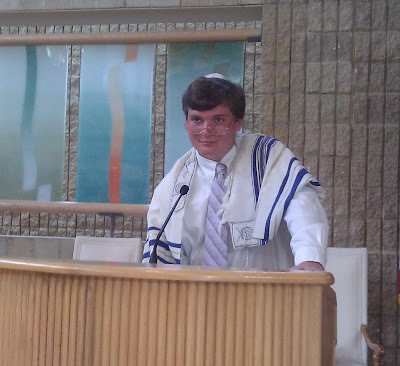 While Brady was getting photographed, Forrest wandered to the lectern and did his best Conservative Rabbi impression. Frankly, I've got to say he nailed it. I'm not sure if he should be a Rabbi, actor, or perhaps both. See what I mean?